13th Battery: Not listed. Most histories indicate this battery was never fully organized and ceased to exist, officially, in April 1862. But that’s not exactly accurate. The battery did organize and saw action at Shiloh. There it lost five of six guns (for a good, brief discussion, see this article). As the battery fell into disfavor (and likely was the scapegoat for the poor performance of a division commander…) it was disbanded. The men and equipment remaining were distributed to other Ohio batteries (namely the 7th, 10th, and 14th Batteries). 14th Battery: Reporting at Corinth, Mississippi with two 12-pdr Napoleons and four 3-inch Ordnance rifles. The battery was part of Second Division, Sixteenth Corps. Captain Jerome B. Burrows remained in command. In November, the battery was part of the “Left Wing” of the corps, advanced to Lynnville, in south-central Tennessee to guard the sensitive supply lines in that area. 15th Battery: At Natchez, Mississippi with four 6-pdr field guns. Captain Edward Spear, Jr. remained in command. The battery was in Fourth Division, Sixteenth Corps at the end of the Vicksburg campaign. And it took part in the Jackson Campaign which followed. Transferred in late July, with the division, to the Seventeenth Corps, it formed part of the garrison of Natchez. The battery took part in an expedition to Harrisonburg, Louisiana in September. 16th Battery: Reporting at Carrollton, Louisiana with four 12-pdr Napoleons and two 3.80-inch James Rifles. Captain Russell P. Twist remained in command. The battery was with Third Division, Thirteenth Corps, recently transferred to the Department of the Gulf. In late September, the battery transferred to Berwick Bay (Morgan City), southwest of New Orleans, for garrison duty. 17th Battery: At Vermilion Bridge, Louisiana with six 10-pdr Parrotts. The battery was assigned to Tenth Division (re-designated Fourth), Thirteenth Corps. When transferred to the Department of the Gulf, the battery was assigned to the garrison at Brashear City (Morgan City), Louisiana. Later the battery moved to the location given in the return. The battery was among the forces used in the Teche Expedition in October. Captain Charles S. Rice remained in command. 18th Battery: No report. Captain Charles Aleshire’s battery was in First Division, Reserve Corps, Army of the Cumberland, and had six 3-inch Ordnance Rifles. The battery saw action on September 18, supporting the division along the Ringold Road. And was in action again on September 20 on Snodgrass Hill on the left end of the Federal line. With the general withdrawal that evening, the battery returned to Chattanooga. 19th Battery: At Knoxville, Tennessee with six 12-pdr Napoleons. Captain Joseph C. Shields commanded this battery, assigned to the Twenty-third Corps. After contributing to the pursuit of Morgan in July, the battery was among the forces under General Burnside’s East Tennessee Campaign. 20th Battery: Reporting, in May 1864, at Nashville, Tennessee with two 12-pdr field howitzers and four 3-inch Ordnance rifles. However, the battery actually had two 12-pdr Napoleons, not field howitzers. The entry is a clerical data-entry error. The battery remained under Captain [John T.] Edward Grosskopff and assigned to assigned to Second Division, Twentieth Corps. And the battery was with that division at Chickamauga. Grosskopff reported firing 85 rounds of ammunition at Chickamagua. In terms of material, he lost only one caisson. The location for this battery, for the end of the quarter, is accurately Chattanooga. 21st Battery: At Greenville, Tennessee with four 12-pdr Napoleons. Captain James W. Patterson commanded. Recall this battery was organized in April 1863. After assisting with the pursuit of Morgan in July, the battery remained at Camp Dennison, Ohio, through much of the summer. Only in September did they move to Camp Nelson, Kentucky. They arrived in Greenville, as the return indicates, around the first of October. The battery was part of the “Left Wing Forces” of the Ninth Corps. 22nd Battery: No report. The battery began the quarter stationed at Camp Chase, Ohio, where they’d just received their full complement of six 3-inch Ordnance Rifles. Commanded by Captain Henry M. Neil, the battery would not move out of Ohio until mid-August. After spending time at Camp Nelson, the battery was dispatched with other forces to the Cumberland Gap, as part of the “Left Wing Forces” of the Ninth Corps. According to the department returns at that time, Neil was serving as Artillery Chief for the Second Division, Ninth Corps. And in his absence, Lieutenant Amos B. Alger led the battery. 23rd Battery: Not listed. This battery was formed from the 2nd Kentucky Infantry and later became the 1st Kentucky Independent Light Battery. Only mentioned here due to “placeholder” status. 24th Battery: At Cincinnati, Ohio with six 3-inch Ordnance Rifles. Officially mustered on August 4, this battery was posted to Camp Dennison until September 22, when they moved to Cincinnati. Captain John L. Hill commanded. 25th Battery: Reporting from Little Rock, Arkansas, in May 1864, with two 3-inch Ordnance rifles and four 3.67-inch rifles. Captain Julius L. Hadley remained in command. Assigned to First Cavalry Division, Department of Southeast Missouri, the battery served on expeditions into northeast Arkansas in July. In August, the battery was among the forces sent toward Little Rock as part of Steele’s Expedition. 26th Battery: At Vicksburg, Mississippi, with no cannon reported. 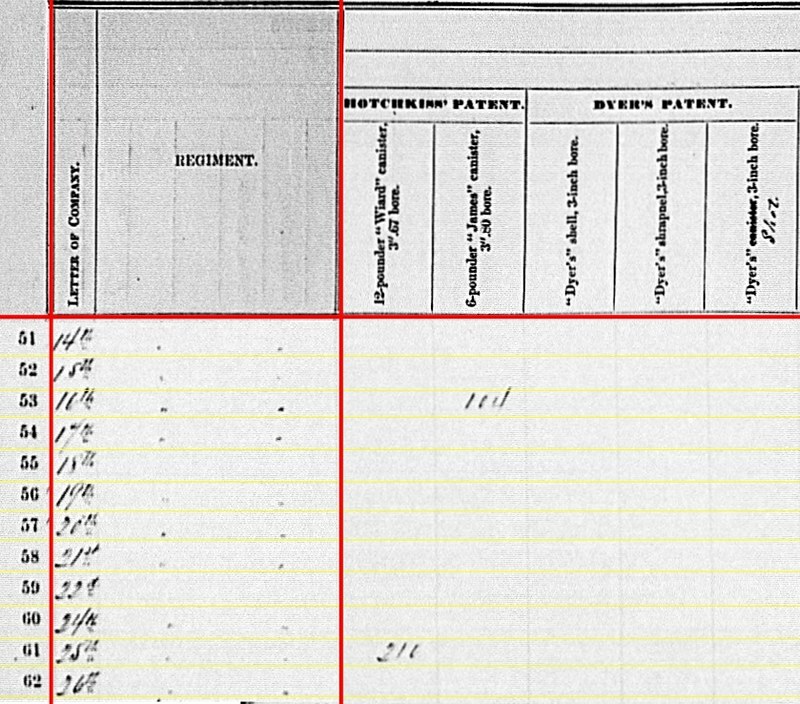 An interesting unit history, originally being a company in the 32nd Ohio Infantry, that I alluded to in the last quarter. Briefly, detailed to artillery service earlier in the war, but still under the 32nd Infantry, the battery was captured at Harpers Ferry in September 1862. Exchanged, the “battery” resumed infantry duties. That is until during the siege at Vicksburg when captured Confederate cannon were assigned to the regiment. “Yost’s Captured Battery”, named for Captain Theobold D. Yost, served in the siege lines, being highly regarded by senior officers. And after the fall of Vicksburg the men of this temporary battery were detached to Battery D, 1st Illinois and the 3rd Ohio Independent Battery. Yost would command the Illinois battery for a short time that summer. Not until December was the 26th formally authorized. While not officially a battery at the end of September 1863, the men would would form the 26th were indeed stationed around Vicksburg. 14th Battery: 60 shot, 32 shell, 106 case, and 50 canister for 12-pdr Napoleons. 15th Battery: 220 shot, 132 case, and 220 canister for 6-pdr field guns. 16th Battery: 44 shot, 123 shell, 169 case, and 48 canister for 12-pdr Napoleons. 19th Battery: 74 shot, 230 shell, 269 case, and 234 canister for 12-pdr Napoleons. 20th Battery: 47 shot and 39 shell for 12-pdr Napoleons; 32 case and 32 canister for 12-pdr field howitzers. As with the issue mentioned above for this battery, the howitzer ammunition tallies are likely a data-entry error and should be 12-pdr Napoleon rounds. 21st Battery: 276 shot, 126 shell, 164 case, and 128 canister for 12-pdr Napoleons. 14th Battery: 147 canister, 355 percussion shell, and 276 fuse shell for 3-inch rifles. 16th Battery: 88 shot, 70 fuse shell, and 304 bullet shell for 3.80-inch rifles. 20th Battery: 168 canister, 227 percussion shell, and 351 fuse shell for 3-inch rifles. 24th Battery: 48 shot, 168 canister, 120 percussion shell, and 290 fuse shell for 3-inch rifles. Yes, the seldom reported Hotchkiss solid shot for 3-inch rifles! 25th Battery: 116 canister, 85 percussion shell, 43 fuse shell, and 65 bullet shell for 3-inch rifles; 112 shot, 291 percussion shell, and 158 fuse shell for “12-pounder” 3.67-inch rifles. 16th Battery: 104 canister for 3.80-inch rifles. 25th Battery: 216 canister for 3.67-inch rifles. No James projectiles reported, for what it is worth. 17th Battery: 48 shot, 677 shell, 155 case, and 363 canister for 10-pdr Parrott. 24th Battery: 720 case for 3-inch rifles. 25th Battery: 37 shell and 46 case for 3-inch rifles. 14th Battery: Thirty army revolvers and thirty horse artillery sabers. 15th Battery: Eight cavalry sabers. 16th Battery: Twenty-four navy revolvers and two cavalry sabers. 17th Battery: Eight army revolvers. 19th Battery: Thirty navy revolvers and twelve cavalry sabers. 20th Battery: Eight army revolvers and ten horse artillery sabers. 21st Battery: Twenty-eight navy revolvers and thirteen horse artillery sabers. 24th Battery: Thirty army revolvers and thirty horse artillery sabers. 25th Battery: Twenty-six navy revolvers and fourteen cavalry sabers. That concludes the Ohio independent batteries. 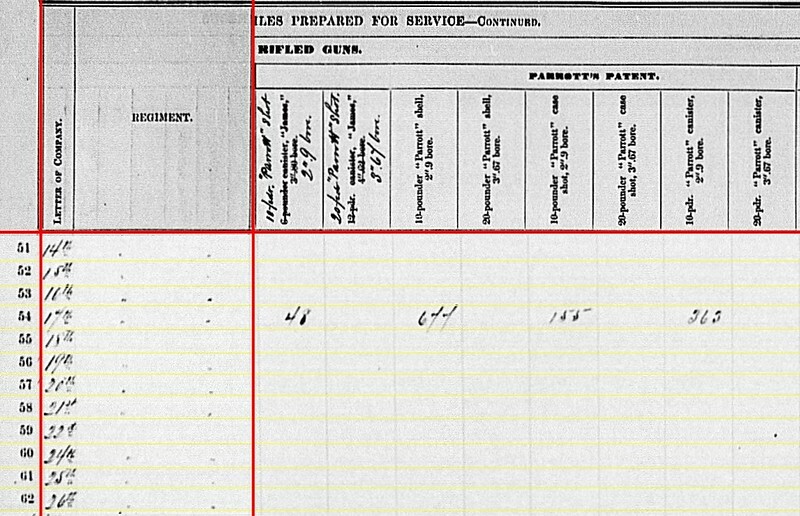 Next we will look at a couple of lines below those listings, covering artillery reported from infantry regiments. And I’ll mention a couple that escaped notice of the Ordnance officers. 13th Battery: “Not in service.” This battery ceased to exist, officially, in April 1862. 14th Battery: Reporting, as of August, 1863, at Corinth, Mississippi with two 12-pdr Napoleons and four 3-inch Ordnance rifles. However, at the end of June, the battery part of the District of Jackson (though at Lynnville, Tennessee), Thirteenth Corps. Lieutenant Homer H. Stull was the commander “in the field” with the battery. But Stull died in May. Captain Jerome B. Burrows returned later in the spring. 15th Battery: At Vicksburg, Mississippi with four 6-pdr field guns. Captain Edward Spear, Jr. remained in command. The battery was in Fourth Division, Sixteenth Corps, and serving in the siege of the city. 16th Battery: Reporting on September 25, 1863 as at Carrollton, Louisiana with one 6-pdr field gun, one 12-pdr Napoleon, and three 3.80-inch James Rifles. Captain (promoted that spring) Russell P. Twist remained in command. The battery was with Twelfth Division, Thirteenth Corps. As such it was involved with the Vicksburg siege at the end of June 1863. 17th Battery: At Vicksburg, Mississippi with six 10-pdr Parrotts. The battery was assigned to Tenth Division, Thirteenth Corps. Captain Ambrose A. Blount remained in command through the much Vicksburg Campaign, but resigned on July 2. Lieutenant Charles S. Rice was promoted to replace Blount. 18th Battery: Reporting at Tullahoma, Tennessee with six 3-inch Ordnance Rifles. Captain Charles Aleshire’s battery was in First Division, Reserve Corps, Army of the Cumberland. 19th Battery: As of January 1864, reporting at Knoxville, Tennessee with six 12-pdr Napoleons. The battery remained at Lexington, Kentucky through the first weeks of June. After which, Captain Joseph C. Shields’ battery was involved with the pursuit of Morgan. The battery was officially in the District of Central Kentucky. Later, in July, the battery was placed in First Division, Twenty-third Corps. 20th Battery: Reporting, in June 1864, at Chattanooga, Tennessee with two 12-pdr Napoleons and four 3-inch Ordnance rifles. The armament is fine. But for June 1863 the battery was involved with the Tullahoma Campaign, and thus somewhere near Hoover Gap at the end of the quarter. The battery remained under Captain [John T.] Edward Grosskopff and assigned to assigned to Second Division, Twentieth Corps. 21st Battery: No report. The battery remained at Camp Dennison, Ohio, presumably still with six 12-pdr Napoleons. Captain James W. Patterson, commanding. The battery was involved with the pursuit of Morgan in July. 22nd Battery: No report. After organizing, the battery moved briefly to Wheeling, West Virginia (to counter resistance to the draft), with only two guns. In mid-June the battery moved back to Camp Chase, Ohio, where two more guns were assigned. Caliber not reported. Commanded by Captain Henry M. Niel. 23rd Battery: “Not in service.” This battery was formed from the 2nd Kentucky Infantry and later became the 1st Kentucky Independent Light Battery. Only mentioned here due to “placeholder” status. 24th Battery: No report. Not mustered until August 1863. However, the battery does appear as assigned to the Department of Ohio with Lieutenant James W. Gamble assigned command of recruits gathered at Camp Dennison. 25th Battery: Reporting from Little Rock, Arkansas, in May 1864, with two 3-inch Ordnance rifles and four 3.67-inch rifles (replacing four 6-pdr smoothbores from the previous quarter). In June 1863 the battery moved from Rolla to Pilot Knob, Missouri. There the battery became part of the force that would advance on Little Rock in August. Captain Julius L. Hadley was in command. So of thirteen numbers, eight were posted to active departments. Three were forming up. And two were just administrative placeholders. 14th Battery: 148 shot, 48 shell, 150 case, and 50 canister for 12-pdr Napoleons. 15th Battery: 233 shot, 123 case, and 220 canister for 6-pdr field guns. 16th Battery: 46 shot, 90 case, and 26 canister for 6-pdr field guns; 61 shot, 54 shell, 106 case, and 26 canister for 12-pdr Napoleons. 19th Battery: 74 shot, 251 shell, 293 case, and 234 canister for 12-pdr Napoleons. 20th Battery: 62 shot, 41 shell, 34 case, and 34 canister for 12-pdr Napoleons. 14th Battery: 147(?) canister, 385 percussion shell, and 276 fuse shell for 3-inch rifles. 16th Battery: 190 shot and 120 fuse shell for 3.80-inch rifles. 18th Battery: 246 canister, 115 percussion shell, 694 fuse shell, and 493 bullet shell for 3-inch rifles. 20th Battery: 148(?) canister, 214 percussion shell, and 365 fuse shell for 3-inch rifles. 25th Battery: 410 shot, 360 percussion shell, and 40 fuse shell for 3.67-inch rifles. 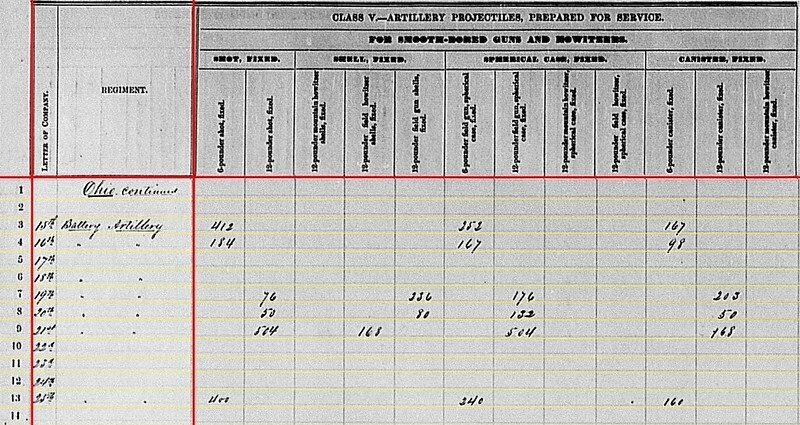 Notice the 25th Battery did not report Hotchkiss rounds for their 3-inch rifles. 16th Battery: 104 Hotchkiss canister for 3.80-inch rifles. 25th Battery: 160 Hotchkiss canister for 3.67-inch rifles. 25th Battery: 172 Dyer’s shrapnel for 3-inch rifles. 16th Battery: 50 shell and 450 case for 3.80-inch rifles. 17th Battery: 240 canister for 10-pdr Parrotts. This begs the question as to what Blount’s battery was firing at Vicksburg. 25th Battery: 159 shell and 80 canister for 3.67-inch rifles. 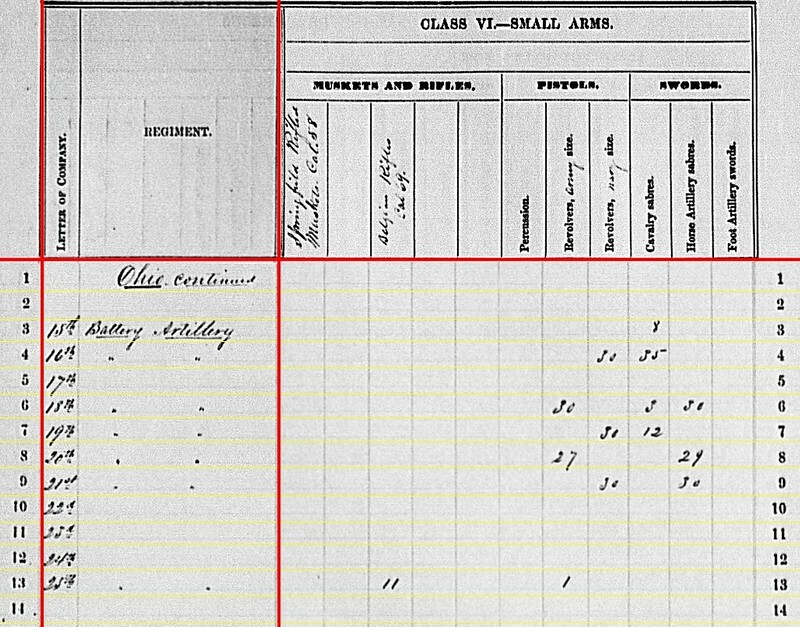 The 25th had a variety of projectiles for the rifled 6-pdrs, but apparently only shrapnel for the 3-inch rifles! 16th Battery: Twenty-five Navy revolvers and twenty-two cavalry sabers. 17th Battery: Nine Army revolvers. 18th Battery: Thirty Army revolvers, three cavalry sabers, and thirty horse artillery sabers. 20th Battery: Twenty-five Army revolvers and twenty-nine horse artillery sabers. 25th Battery: Six “Rifled muskets, foreign manufacture”, twenty-six Navy revolvers, and fourteen cavalry sabers. From the previous quarter, the 25th Battery reported Belgian rifles. Next we will look at the 1st Ohio Light Artillery’s batteries. Of those listed, the clerks recorded only seven returns. The other four are left for us to fill in the blanks. And we should see the 26th Battery on this list, but don’t. 15th Battery: Reporting at Memphis, Tennessee with four 6-pdr field guns. This battery was in the Fourth Division of the “original” Thirteenth Corps. The division first went to the Seventeenth Corps, under reorganization in December 1862. But in late January 1863 was transferred to Sixteenth Corps. Captain Edward Spear, Jr. commanded at the start of the quarter. Lieutenant James Burdick filled the position temporarily in April. 16th Battery: No location given, but with two 6-pdr field guns and four 3.80-inch James Rifles. Lieutenant Russell Twist commanded this battery, which was at the time posted to Helena, Arkansas. Moving with it’s parent formation, the Twelfth Division (of Grant’s command), the battery shifted from District of Eastern Arkansas to the (new) Thirteenth Corps. 17th Battery: No report. Captain Ambrose A. Blount remained in command. The battery was assigned to Tenth Division, Thirteenth Corps. As such, the battery saw considerable activity supporting the bayou expeditions during the winter months, operating out of Milliken’s Bend. 18th Battery: Listed as at Chattanooga, Tennessee with six 3-inch Ordnance Rifles. The location may be valid for March 1864, as received in Washington. However, for the first quarter of 1863, Captain Charles Aleshire’s battery operated out of Franklin, Tennessee, as part of the Reserve Corps, Army of the Cumberland. 19th Battery: At Lexington, Kentucky with six 12-pdr Napoleons. The 19th, under Captain Joseph C. Shield, was part of the Army of Kentucky, then garrisoning the rear areas of the Department of the Cumberland. 20th Battery: Murfreesboro, Tennessee with two 12-pdr Napoleons and four 3-inch Ordnance rifles. Under Captain Edward Grosskopff and assigned to Second Division, Twentieth Corps. 21st Battery: Reporting at Camp Dennison, Ohio with six 12-pdr Napoleons. Captain James W. Patterson, commanding. 22nd Battery: No report. This battery was not fully organized until later in the spring. 23rd Battery: No report. Mustered in 1861, this battery was attached to 2nd Kentucky Infantry. It became the 1st Kentucky Independent Light Battery (Or Battery A, Kentucky Light, as one may prefer). 24th Battery: No report. Not organized August 1863. However, the battery does appear as assigned to the Department of Ohio with Lieutenant James W. Gamble assigned command of recruits gathered at Camp Dennison. 25th Battery: At Camp Forsyth, Missouri with four 6-pdr field guns and two 3-inch Ordnance rifles. Formed as the 3rd Battery Kansas Artillery, this battery was re-designated as the 25th Ohio Independent Light Battery in February 1863. Captain Julius L. Hadley was in command. Battery assigned to the Department of the Missouri. 26th Battery: Not listed. This battery was actually Company F, 32nd Ohio Infantry, detached for artillery service. It was among those units surrendered at Harpers Ferry on September 15, 1862 (thus no report). Upon receiving their exchange, the battery resumed duty as infantry in Company F. This began a curious story where by Captain Theobold D. Yost’s men were sometimes a battery and other times infantry. Only in December 1863 was the 26th permanently established. So we see the service of these twelve batteries was mostly west of the Appalachians. 15th Battery: 412 shot, 252 case, and 167 canister for 6-pdr field guns. 16th Battery: 184 shot, 167 case, and 98 canister for 6-pdr field guns. 19th Battery: 76 shot, 236 shell, 176 case, and 203 canister for 12-pdr Napoleons. 20th Battery: 50 shot, 80 shell, 132 case, and 50 canister for 12-pdr Napoleons. 21st Battery: 504 shot, 504 case, and 168 (or 468) canister for 12-pdr Napoleons. But also reporting 168 shell for 12-pdr field howitzers. 25th Battery: 400 shot, 240 case, and 160 canister for 6-pdr field guns. The presence of 12-pdr howitzer shells in the 21st Battery may simply be a transcription error. And may simply be inconsequential given the battery’s status at Camp Dennison. 15th Battery: 313 shot and 356 fuse shell for 3.80-inch James. 18th Battery: 158 canister, 142 percussion shell, 765 fuse shell, and 574 bullet shell for 3-inch rifles. 20th Battery: 184 canister, 306 percussion shell, 110 fuse shell, and 160 bullet shell for 3-inch rifles. 25th Battery: 80 canister, 67 percussion shell, 92 fuse shell, and 160 bullet shell for 3-inch rifles. 15th Battery: 136 Tatham’s canister for 3.80-inch James rifles. 15th Battery: Eight cavalry sabers (only!). 16th Battery: Thirty Navy revolvers and thirty-five cavalry sabers. 20th Battery: Twenty-seven Army revolvers and twenty-nine horse artillery sabers. 21st Battery: Thirty Navy revolvers and thirty horse artillery sabers. 25th Battery: Eleven “Belgian Rifles, Cal .69” and one Army revolver. That last line is noteworthy, but not of great significance. Hadley’s battery, stationed in Missouri, certainly would find use for rifled muskets. The identification given, Belgian, almost certainly points to the imported Liege weapons. Mostly these were copies of French Chasseur de Vincennes .69 type. And Ohio, among other states, imported quantities. However, there was an “artillery carbine” in the family of weapons, and produced in .69 caliber. But I’m not aware of those being rifled. 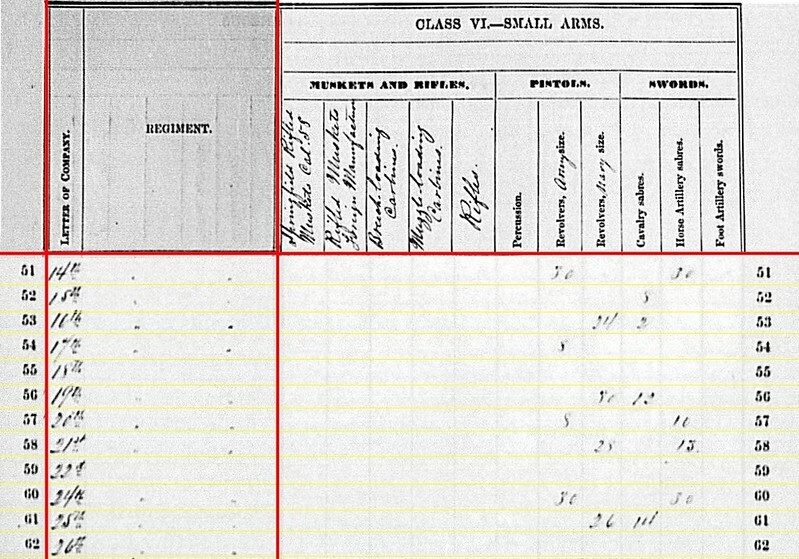 One closing shot with the Ohio batteries, though not of the “field” variety… Among other reports from the first quarter 1863 is a listing of the 2nd Ohio Heavy Artillery being organized at Camp Dennison. Lieutenant William H. Smith was in command of the detachment there. He reported 184 Enfield rifles on hand, but no cannon. I can only speculate that the 1st Ohio Heavy Artillery (being converted around this period from the 117th Ohio Infantry) was similarly equipped.